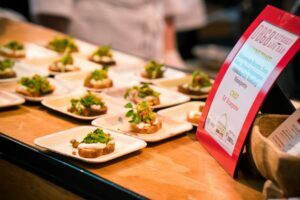 Washington, D.C. – On Monday, June 19th, 40 of the area’s best chefs and mixologists will serve up special tastings of their signature dishes at Chef’s Best Dinner & Auction. Hosted at the Marriott Marquis, Chef’s Best will benefit Food & Friends, a non-profit organization based in Washington, DC that provides life-sustaining meals to those living with HIV/AIDS, cancer, and other serious illnesses. Thanks to the efforts of Chef Chair Marjorie Meek-Bradley of Smoked and Stacked, guests will enjoy tastings prepared by some of the region’s most talented chefs including: Erik Bruner-Yang, Maketto & Paper Horse, Tony Chittum of Iron Gate; Amy Brandwein of Centrolina, and Matt Adler of Schlow Restaurant Group (Tico, The Riggsby, Alta Strada and more), among other notables from the DC dining scene. In addition, attendees will have the opportunity to bid on an array of exciting silent and live auction items featuring fantastic trips, one-of-a-kind experiences and private dining opportunities. Proceeds from Chef’s Best will ensure the delivery of medically-specialized meals and personalized nutrition counseling to Food & Friends’ clients living with cancer, HIV/AIDS and other life-challenging illnesses. This year, Food & Friends will provide nearly 1 million meals to more than 2,600 seriously ill individuals in Washington, DC, Virginia and Maryland. The event will also honor longtime Food & Friends supporters Fleur Bresler and the Bresler Family as this year’s Chef’s Best honorees, a family with deep roots in the Washington Area. Tickets are $350 and sponsorships start at $1,000. Visit www.foodandfriends.org/ChefsBest to purchase tickets and see a current list of chefs and sponsors. The President’s Reception for sponsors begins at 5:30pm. Doors open for the main event at 6:30pm, with bidding for live auction starting around 8:30pm. Food & Friends depends on the support of corporations, foundations and individuals and is grateful for the sponsors who have contributed to Chef’s Best.